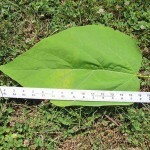 The catalpa is a medium large tree, growing 40-60 feet tall and 20-40 feet wide. On a hot summer day, the deep shade provided by its large leaves makes it ideal for relaxing in a lounge chair or sharing a meal at a picnic table beneath its canopy as very little daylight reaches the ground. The common name is “cigar tree” due to its long slender brown seed pods. In the later fall or early winter, once dried, these make great kindling to get a campfire or woodstove started. It is also known as the Catawba for the Catawba Indian Nation from South Carolina. The spelling of catalpa was perhaps a misspelling by an early botanist. According to the Arbor Day Foundation, hummingbirds visit the blossoms and the nectar and pollen supports bees. The tree is adaptable in its habitat, growing well near streams as well as high dry ground. In the landscape, it needs plenty of room. Understory planting is limited due to shade. It can tend to be messy by dropping its seed pods and small weaker branches are prone to wind damage so it is best planted in low traffic areas. There is a southern catalpa (Catalpa bignonioides) and a northern variety (Catalpa speciosa). Because of their adaptability, both have become naturalized into many states. The Arbor Day website lists the tree growing from southern Illinois and Indiana to western Tennessee and Alabama and that it was first cultivated in 1754 with the wood used for fence posts and railroad ties because of its resistance to rot. 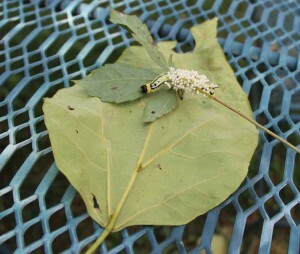 Observers may see a guest inching along the catalpa leaves. 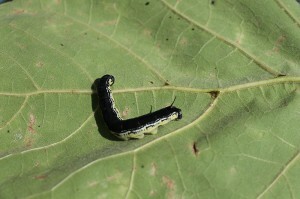 The catalpa sphinx caterpillar (Ceratomia catalpa) feeds exclusively on the catalpa and can cause quite a bit of defoliation. Because of the cyclic nature of their populations with predators keeping their numbers in check, even if a healthy tree is severely defoliated one summer, it can usually recover and be fine the next summer. The mature caterpillar is striking in appearance with a horn on its back section, deep black back and chartreuse green on its sides. One of its main predators is the avid human angler who collects it as fish bait. Apparently the interior of the caterpillar is a delectable neon green goo that attracts fish, particularly catfish. 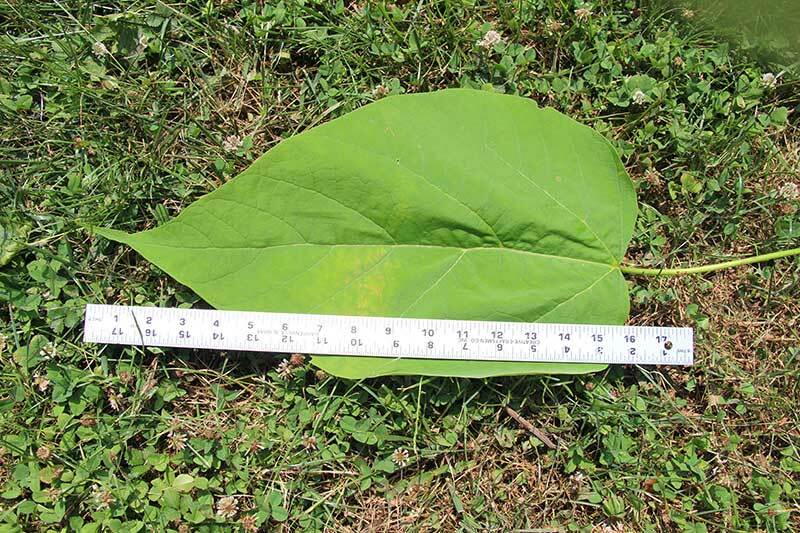 The catalpa is an attractive fast-growing tree and, due to its ability to thrive in both moist and dry areas, provides landscapers with a good native tree choice. 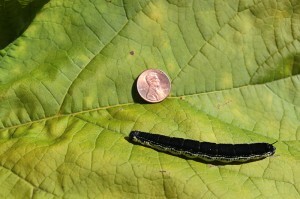 UPDATE: The catalpa sphinx caterpillar has been spotted in Luray as of Friday, July 25! This specimen was found on a mature catalpa tree but has been heavily parasitized by a wasp. According to L. L. Hyche of the Department of Entomology at Auburn University, the female wasp deposits eggs through the skin of the caterpillar. The wasp larvae develop and feed inside then emerge and spin noticeable white silken cocoons on the caterpillars skin. Natural enemies such as the parasitic wasp tend to keep the populations in check.